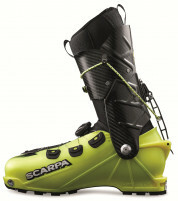 The Gara Aero World Cup race ski is the pinnacle of Ski Trab research and development. Using the new Attivo production process, the Gara (Italian for Race) Aero WC consists of 14 layers of lightweight technology. A Hibox 3k carbon fiber filament encases several layers of secret sauce wrapped around an Aramid honeycomb core. If you haven't heard of Aramid, you haven't worked in the aerospace industry. It's a synthetic fiber with an incredible strength-to-weight ratio, and is woven ingeniously by Ski Trab into a honeycomb pattern to make a stable and durable ski core. Also included in the Attivo ultralight line are shock absorbers running lengthwise along the top of the ski that reduce vibration and add structural protection to the edges, reducing blowouts. Unmatched 3 year warranty on a race ski. Progressive Attivo shape with a side cut moved backwards to enhance steerability on the hard pack. Progressive Attivo flex with a gradually softening tip that allows a smooth entry and perfect float on soft snow. Active Attivo shock absorber system makes for a smooth ride and strengthens the sides of the ski. New Attivo skin fixing system makes applying and ripping skins faster while accounting for the shape of the ski sides. DuoTech tail technology allows maximum flexibility in turns while maintaining stability and direction when flat. Micro-mesh carbon cage called Hibox wraps the ski, adding up to 46% more torsional rigidity. Sintered base with careful finishing makes the glide buttery. Light Tech anti-scratch polyamide topsheet with a water-repellent nanotechnology finish. Update 2015/16: Trab has introduced a stiffer version of their iconic race ski. The Flex 70 has the same shape and profile but is slightly more rigid, especially in the tail. This is good for big or backseat skiers. The traditional ski with a buttery flex is now labelled Flex 60. Construction Cap with shock absorbtion, 14 total layers. Notes Attivo progressive flex & shape are designed to match all snow conditions. Bottom Line Rando racing meets aerospace. I have raced on these a couple of times. Bought the 70 flex, I'm 5'9" 145lbs, which I was told would be much too stiff, but I'm a huge fan. For reference I am skiing these quite fast and hard, and generally prefer a stiff ski. An awesome high-level race ski where the descents make or break races. These ski noticeably, but not overwhelmingly better than others I've raced on: merelli, fischer, dynastar, etc. Unlike the picture the tip attachments work with all, bot just the proprietary trab tips. Pomoca, PDG, contour, etc. Comes at ~45 gram penalty in comparison to other high-end race skis. You're not going to hit the 750g ski+binding+screw spec. But world cup winners are often on these, maybe...and it hurts me to say this...45 grams doesn't make much difference. Hi, just a simple technical question. I have the previous and the most recent model of the Gara Aero. I use the PG Black with the new one and the LS Syborg with the older ski. I found that the front pieces on one pair are mounted on slightly different locations compared to the other pair. The recent model (for the PG) has the toe pins mounted exactly at the transverse line (or arrow) and the toe piece on older model (I use with the Syborg) are mounted about 1.3 cm backwards. Hi Erwin, the mark is the front of the boot, not the pin line. Sounds like your blacks were mismounted. But if you like how they ski, no worries! How is the skis' capability on lift-served resorts? There I am mostly on black diamond, double black diamond (both groomed and ungroomed), and sometimes the backside of the mountain. Hey Lee! They are far, far better in ungroomed terrain than groomed. They were frankly a bit underwhelming on corduroy and there are other race skis that are better for that purpose. They weren't bad on groomers at all, it was still fun, but their capability on groomers isn't anywhere near in line with their capabilities in rougher, more challenging terrain. Where they really start to separate themselves from the rest is how well it handles the stuff you'd usually avoid (tracked out powder, crud, etc) and stuff that's usually really tough on race skis. I was blown away at how well they handled the worst snow and underwhelmed at how they handled the easiest snow. What's your goal with this ski though? Are these destined for skiing in the resort? Send help@skimo.co an email if you have any further questions, I'm interested to hear what your plans are with this ski. I am 6' 160lbs intermediate skier that will use these as resort skis. I think the 164 length will be perfect but i am curious on flex. Do you think 60 would work for me or should I wait for younto get 70 in stock? Also, do you know if TRAB is coming out with an updated version for 2018-19? Hey Tom! Skis should stay the same for next year, but I would probably lean towards the 70 flex for this application. If it were primarily a race ski that would be used in the typically unforgiving race conditions, I think the 60 would be nice just because it would be more manageable on tired legs, but with the even turn consistency and power related to ripping groomer laps, I think the 70 would end up being more fun. Just to be clear, these aren't for lift served resort skiing, correct? They're for human powered skiing within resort boundaries? Thanks Trace....you got it, they are for human powered fun. Do you intend on stocking 164 flex70 this year? If not, sounds like the 60s could work. Hey Thomas. Perfect. Yeah we should be getting the 164cm 70 flex this season. If anything changes I'll let you know but that's the plan. Really, the 60s would be fine but I think you might have more fun on the 70s, especially when you want to open it up and see what they're capable of. 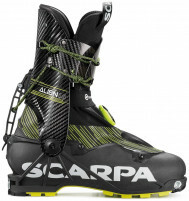 1) What is the difference between La Sportiva GARA AERO LS and this one? 2) Which length and flex is ideal for a 5’11 and 130 pounds man? Hi Haoran, the difference is twofold: graphics and warranty. Aside from the obvious color difference, the Trab is backed by a 3-year warranty versus a 1-year warranty from Sportiva. You want the 164 Flex 60. I would like this skis and also need recommendations on selecting bindings. I had SKI TRAB TR 2 binding (5-11)+SKI TRAB MAXIMO for the last season. I had both release values at 5, the lowest digit, without any pre-release on mogul and little jump. They would also release at the right moment when I fall and roll. I am not an aggressive skier and because of my 130 lbs weight, the low release value is desired. I am looking for the lightweight bindings that come with the similar release values as 5 to SKI TRAB TR 2 (6 or 7 to that is acceptable). Hi Haoran, binding release can be a complicated topic. Your best bet is to plug your info into our binding finder. There are a couple options that I think would work reasonably well for you. Hi can you explain the pros and the cons between Aero flex 60 and 70? Hey Gabriel! There aren't necessarily pros and cons to the different flexes and the softer one definitely isn't less durable than the stiffer one. I think it depends a bit more on how much you weigh or how you ski. For example, I weigh 59kg and skied the 60 flex and it was great, but only as long as you are willing to really pay attention to the ski. If you are about 70kg or heavier you could probably choose based on how stiff of a ski you want, but if you are substantially heavier than that you should probably go with the 70 flex. One way or another, these are without a doubt my personal favorite race ski. So smooth, so fast, so capable. It almost makes skiing bigger skis not even worth it because they ski so well. Hi, im using an atomic UL 78, but im considering a new skimo set for a few races but most of the time to go faster on the mountain and very long traverses. I usually ski in pretty different snows, from fresh, to vented and also hard in some couloirs. Can you give me any feedback? Im really comfortable in the flex, grip in icy, and good flotation of my UL 78, so will like to have something similar but lighter and faster skining. Gaby,The Ski trab world cup is a very strong, precise ski. With a stiff tail. If you like the UL 78, you probably would like the Atomic UL 65. It has very similar flex and feel to your UL78. How much does the flex matter with this ski? I see that the 164 60 flex is sold out now. I would use it for racing and I'm not a big person by any means. I'm 5' 9" 160 and I'm not a crusher on the downhill but I'm pretty good on most terrain. Is there a noticeable difference and is it worth waiting until the 60 flex is back in stock? Hey Andrew, I think you're right in the middle and could probably go either way. The difference is noticeable between flexes so if you prefer a softer ski then the 60 Flex would be perfect, but the 70 will be more of a stiff race ski feel. for a 6'1 185 skier would you recommend the 164 or 171 length? Hey Anthony, I'd say it depends on the usage. If this will be exclusively a race ski then the 164 would make the most sense just because it's lighter and easier to maneuver. However, if this will be a lightweight mountaineering ski/adventure ski or you plan on using it outside of a race environment and still occasionally pull double duty as a race ski, then the 171 makes sense. Most of our shop staff is around your height and weight and we all use the shortest, lightest skis possible for pure racing but prefer a slightly longer or slightly wider ski for any fast skiing outside of a race environment. Hi Anthony, for skiing certainly the 171. However most folks will use the shortest length possible for racing, which gets to be more of a skiing handicap the bigger you get. You're not to the size where the 164 would be a crippling handicap on the down, so you could get away with that length. Hi Caroline, these are 6.4-6.5cm wide underfoot, depending on the length. More details on the Specs tab. Hi, I'm not interested in racing, but I'm wondering about these skis in terms of long approaches in the back country mostly on snowmobile trails to get to mountains I can climb then descend skiing? Given my long access (7-10 miles gradual uphill), I probably will only ever make 1 run then take my long descent out. Is there any camber in these skis, or at least do they have more flex than a traditional alpine board? I'm really wondering if i can 'skate' these on packed snow mobile trails for faster travel? I currently use a pretty light classic nordic ski (Fischer Superlight) set-up for touring the same snow mobile trails and given terrain/conditions, I either stride or skate them, but I can't take them up or down anything too steep or off piste without risking injury and broken equipment. So if I could travel nearly as quickly as I can with my Superlight Nordic skis, it will open up tons of options for me. 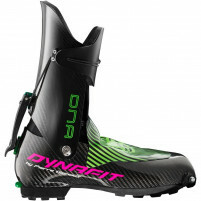 In short, I was wondering if this ski would give me the ability to skate or marathon skate using an appropriate lightweight boot? Thank you. So I am an aggressive intermediate skier on the larger end of the spectrum (6'5"; 235 lbs) ...not a jump huckster or mogul skier but certainly capable of descending the blacks at speed. Took my new set of skimo skis (Trab world cup Gara Aeros; 171, 70 flex with Plum 150 bindings and Syborg boots) to Nakiska in Kananaskis country Alberta. Pretty typical resort skiing, fair bit of ice and very hard snow mixed with some decent sugar here and there. I was expecting to struggle on these ultra light sticks with the flexy skimo boots but was pleasantly surprised. After a slightly shaky start I was able to find my feet after two or three runs and pretty soon was charging as hard on these as I might on a "proper downhill ski". They do wobble about a bit and get kicked around by chunky irregular snow but once you get used to em and are able to ignore the jumpiness they do keep going in the right direction and are plenty stiff enough to hold their edges in ice and very hard snow. Also they skate extremely well (as you might expect). Overall I am very happy with these skis. They ski downhill on piste extremely well and handle awkward variable snow well enough for a relative noob like me. thanks, useful review. fourth and fifth words: to satisfy web form. What's the best skin for the Gara Aero World Cup (164 cm)? Hey Justin, it's hard to go wrong with the trab race skins, which have a special tip clasp designed for the flat notch on the Gara Aero. But there is also a simple groove in the tip (not shown in the picture...late addition) that can accept standard bungee-style tips found on most other race skins. AWESOME update from TRAB - the GARA construction has resulted in a lighter stiffer ski that performs in a wide spectrum of conditions. I've been on the duo world cup for the last couple of years and this ski lives up to TRABs high standards. I was a little hesitant with the "proprietary" skin attachment at the tip but have been able to use the same skins I have been using for years. There is a small notch cut into the carbon at the tip that allows a bungy type of attachment (i don't even have a nylon washer - just a knot in the bungy). im looking for size 171, do you have? Hi Luciano, unfortunately we only stocked the 164 length this season. Our only longer race ski right now is the Movement Gold Fish-X. Sorry! Do these skis require the matching Trab tip attachment, or can one use a slot-style tip attachment for racing? Thanks! Hey Aaron... I actually have been using this ski all season and have been able to use my old skins. The new tip has a unique skin attachment but there is also a small notch cut that will accept a "bungie" type of skin attachment. I prefer to use my old skin vs the new attachment due to the fact that if you knock the new tip off it is much more difficult to reattach it with out taking your ski off and stripping/reattaching the whole skin.